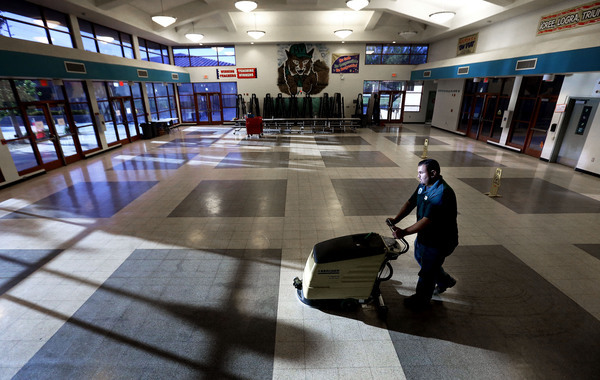 As he cleaned the vacant classrooms in Mountain Vista Elementary School during his shifts as a night custodian, Zenon Castro could see in great detail the place where one day he would teach. The chairs that he lifted onto the desktops to make room for his vacuum cleaner would be filled with young students eager to learn. Each wall would display the subjects students would study: an English wall with posters of the alphabet characterized by animals with names from A to Z, a science wall detailing the four seasons, and another for math with basic equations symbolized using apples or baseballs. Zenon Castro plans to swap his cleaning supplies for textbooks and become a special education teacher, fulfilling a lifelong dream. Castro’s lifelong dream of becoming a teacher is finally within reach. 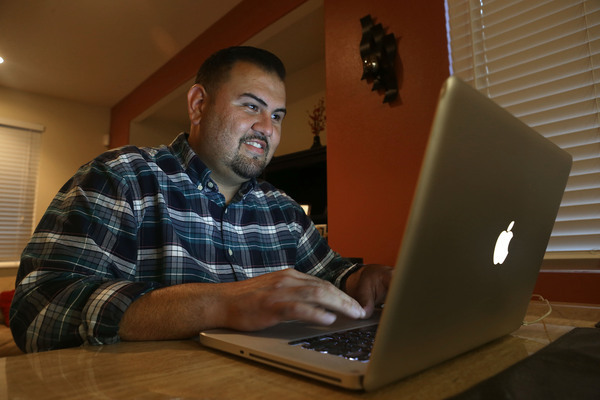 The 32-year-old Grand Canyon University alumnus, who graduated with a master’s degree in special education which he completed online in June, plans to teach special-needs children. Castro began working as a custodian at Mountain Vista, a K-6 school in the Coachella Valley Unified School District in Indio, Calif., in 2012 to pay the bills while gaining the 75 hours of student teaching required to graduate. He is taking the Arizona and California state educator exams to become a certified teacher and expects to receive the results this fall. When he finally does get his own classroom, Castro will waste no time setting it up just the way he always imagined. He felt called to work with special-needs children after his mentally disabled older brother died when Castro was 3. For Castro, helping children with disabilities started in adolescence. He remembers trips to the hospital to visit his brother, who spent his entire life there before passing away at age 5 of complications from premature birth. Growing up without a sibling was difficult, and Castro mourned that loss until his sister was born when he was 9. His passion for helping people with disabilities carried over into junior high. Castro often took care of his best friend, who was in a wheelchair after being hit by a vehicle with a drunk driver behind the wheel. Castro pushed his friend to class and around the playground at recess, and they had sleepovers and hung out on weekends. Castro often worked 14-hour days during shifts as a teacher’s aide and custodian. When his friend died during high school, Castro decided to pursue teaching as a career. 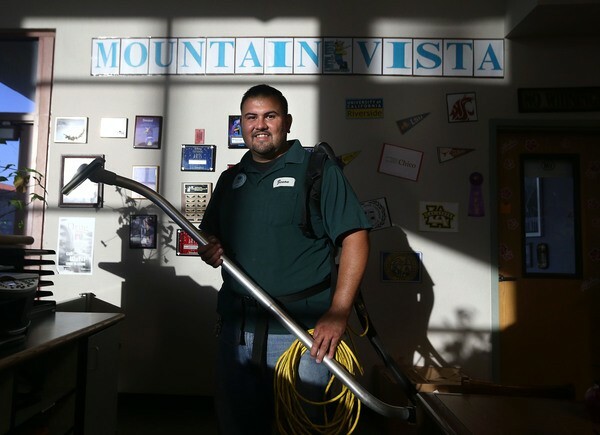 He earned a bachelor’s in liberal arts from California State University, San Bernardino, in 2008, then became an elementary school teacher’s aide for four years before joining Mountain Vista as a custodian. Working both jobs enabled Castro to mentor special education second through fourth-graders outside the classroom. Many visited him as he cleaned after school, asking for homework advice or bullying solutions or, most often, just to give a hug or high-five before heading home. One of his favorite memories was helping an English as a second language student learn to read. Castro worked with him daily, patiently helping him with basic words and sentences. After weeks of working together, the young boy approached him in the school cafeteria to read him a passage from a book for the first time. Cameron Whitcomb, a university development representative in Southern California, sensed Castro’s passion for helping disabled students at their first meeting. Whitcomb had just finished speaking to Mountain Vista’s teachers when Castro approached him with questions about the University’s online education degrees. His story blew Whitcomb away. No one is better suited to teach special education students than Castro, he said. Like most online adult learners, many of whom work full-time or have families, Castro needed a university program that fit his busy schedule. GCU was the only option that made earning his degree possible, he said. For about six months, Castro taught from 8:15 a.m. to 2:45 p.m., Monday through Friday, then changed into his custodian uniform for his 2:45 to 10:30 p.m. shift. Castro studied and worked on class assignments during small windows of free time: before school, during lunch or late at night after work. Castro, the first person in his family with a master’s degree, finished in June with a 3.86 GPA. His wife, Anika, who at magazine press time was due to give birth to their first child, rarely saw him at home because he spent hours on homework when not at work. Castro’s academic success also reflected his determination. He maintained a 3.86 GPA and is the first in his family to earn a master’s degree. The hard work and sleepless nights were just another step in his journey. “It was difficult, but I am grateful. Without GCU, I wouldn’t be where I am today,” he said. Castro hopes to be hired at Mountain Vista and teach one of the school’s two special education classrooms for second-graders this fall after becoming licensed in California. Doing so would be the perfect fit. Castro has the full support of the school’s faculty and staff and, as a Spanish speaker, is well-suited to help the student population which is nearly 94 percent Hispanic, with 35 percent in ESL classes. Additionally, Mountain Vista has a growing number of GCU students and alumni. Second-grade teachers Maria Ramirez and Yessenia Garcia are GCU online students, and assistant principal Michael Boomer is an alumnus. All own GCU shirts – courtesy of Whitcomb – and often talk about their online classes. Castro hopes to take over one of Mountain Vista’s special education classrooms this fall, but plans to continue to serve students as a custodian until he passes the Arizona and California state board exams. Garcia learned about GCU from Whitcomb but became seriously interested in enrolling after talking to Castro. She began a master’s degree in March and hopes to be finished next spring. Garcia said everyone at Mountain Vista hopes Castro receives his own classroom there. For now, Castro will continue at Mountain Vista as a custodian, pending news on his license status. After waiting his whole life to become a teacher, he said he can wait a little longer. “Every student I’ve met or taught has made a difference in my life. I feel comfortable teaching and know I am making a difference because of them,” Castro said. “Watching the difference you make.